Sarah Dessen Archives - Book.Blog.Bake. Macy’s summer doesn’t sound so great at first. Her boyfriend is leaving her for brain camp, she’s taking over a information desk job at a library, and studying for the SAT. When she has to unexpectedly help a caterer at one of her mother’s open houses, Macy realizes there’s something in the chaos of the catering world that she likes. For once, her entire world isn’t planned to perfection, and she has to learn what it means to sometimes let surprises happen on their own. 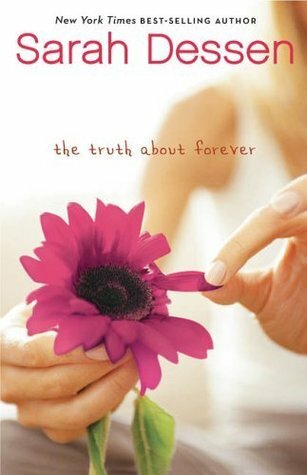 The Truth About Forever is my first Sarah Dessen book. I know she’s a really popular author in YA circles, but her books just don’t sound like my kind of thing. However, this book was on clearance at Books-a-Million and I couldn’t resist. I’m so glad I didn’t try to, because The Truth About Forever was a really moving book that hit close to home for me. Within the first couple of chapters in the book, we find out that Macy’s dad died the year before, which is partially what leads to Macy chasing perfection and trying to control her life so closely. I really loved reading about Macy’s relationship with her dad. I thought Dessen did a perfect job of capturing their relationship and what Macy was going through. I’ve lost a parent too, and even though Dessen very rarely showed us a full scope of Macy’s emotion, she crafted the words in such a way that her grieving was quite evident in a subtle way, which I appreciated. Even though I really loved the characters in this book, it wasn’t perfect for me. It reminds me quite a bit of how I felt about Flash Burnout by L.K. Madigan. The Truth About Forever is a beautiful book, but the plot didn’t compel me the way some other contemporaries have. I think it might be because I’ve never been much for “summer” books. That being said, I did really love all the workers at the catering company, and how Macy found a place there. The Truth About Forever has a bit of a timeless quality to it as well– I got the feeling it could take place in the summer of 2013 or the summer of 1993. I don’t think it’s a book that will ever feel terribly dated, which definitely contributed to my enjoyment of it. Final Impression: I don’t know why I found this review so hard to write, but I did. This book is well-written, the characters resonated with me, but yet I didn’t LOVE it or even REALLY like it– I just LIKED it. It’s a good Summer read that’s not too light(Macy deals with some issues such as grief), but not too serious either, and it definitely has a summer-read quality to it. 3/5 stars. You can find The Truth About Forever at Amazon or Barnes and Nobles.